During his two terms serving the 65th District, Rep. Steve Andersson was a strong supporter of local government—advocating for local control and better government practices. A lifelong resident of Geneva, Illinois, Steve has been an advocate of historic preservation efforts in his hometown community and across Illinois, which resulted in a new Illinois Historic Preservation Tax Credit to improve Illinois communities while retaining the culture and history of the state. 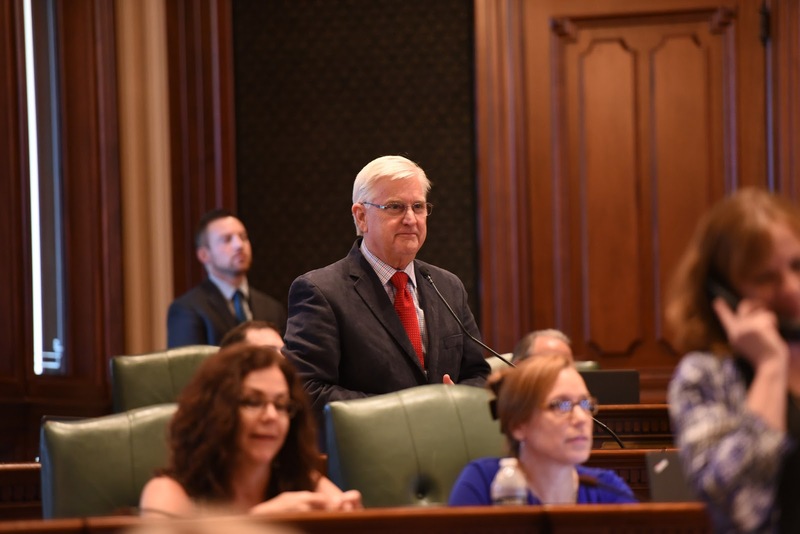 Rep. Andersson improved the criminal justice system by making the fee structure for criminal and civil court cases more manageable and transparent for Illinois residents. Steve staunchly supported mental health efforts both in Springfield and in his District through his advocacy to increase awareness. Steve’s lightheartedness wasn’t lost in the General Assembly, an example being his resolution supporting bacon and the IL Pork Producers. His good hearted nature will be missed on the House Floor. Our dear friend and former colleague Representative Patti Bellock co-authored the SMART Act Medicaid reforms of 2011 and legislation requiring mental health parity, MRSA infection control, improving the Amber Alert system and strengthening child support in Illinois – all of which have been recognized on a national level. 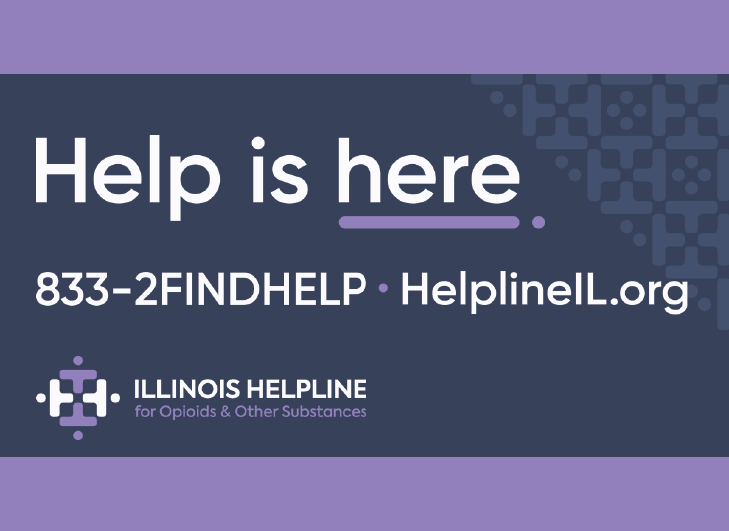 We remember Patti as a tireless advocate for Illinois’ most vulnerable population, especially seniors, the developmentally disabled, and children. Patti was also the very first woman in Illinois history to serve as Deputy Minority Leader here in the House of Representatives, a position she served in from 2013 until July of 2018 when she stepped down to become the new Director of the Illinois Department of Healthcare and Family Services. Representative Peter Breen has been a valued member of the House Republican Caucus for four years. His leadership, expertise, and strong public speaking skills allowed him to be elevated quickly to the role of House Republican Floor Leader, where he has vigorously defended our caucus positions on many critical and often controversial bills. In just four years, Peter ushered 32 of his own bills into law, including a law that allows for electronic filing of business documents which will save small businesses and non-profits millions, and the “Local Government Wage Increase Transparency Act,” which seeks to put an end to pension spiking at the local level. Representative Breen also worked with suburban families with autistic children who attend Lombard’s Soaring Eagle Academy, and passed into law a bill that allows the accredited school for autistic children to transport its K-8 students to off-site locations for educational learning opportunities. Rep. John D. Cavaletto of the 107th District, a retired educator and former basketball coach, has spent the last decade promoting economic and job development for his area through lower taxes and infrastructure improvements such as US Route 50 from the Indiana border to the Metro East in the St. Louis region. He also championed the right to life, grandparents’ rights, and defending the Second Amendment while fighting for fiscal reforms for the State of Illinois. He has advocated for public safety issues through his work with the Fire Caucus and fought for fair funding for all schools. “Coach” Cavaletto as he is respectfully known by his legislative colleagues, received his bachelor’s and master’s degrees from Southern Illinois University at Carbondale where he was instrumental in developing programs for special needs children and young adults. His work was emulated by the Kennedy Foundation and helped to develop what became the Special Olympics 50 years ago. Thank you, Representative Cavaletto for your service to your constituents and to the State of Illinois. We wish you and Connie many years of well-earned retirement with your children and grandchildren. 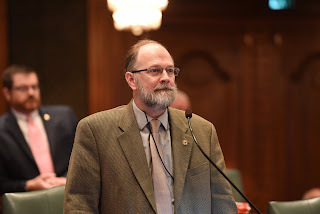 Representative Mike Fortner brought his experience in local government, teaching, and research to the General Assembly in 2007 to help further serve the people of Illinois. He served 12 years in the Illinois House of Representatives for the 95thDistrict and then the 49thDistrict, where he contributed to dozens of bills to help our state. He provided an honest voice and technical reason to countless bills he advocated for. From term limits to fair map redistricting and the pension system, he was integral in reform efforts to better our state. In addition to reform efforts, he improved our electric power system, protected privacy rights, and changed the way we recycle electronic equipment. With his diverse background of public service, professional work, and community service, Representative Fortner helped make a positive difference in the lives of Illinois residents, and his work in the Illinois House of Representative will be remembered. We’re going to miss Chad Hays’ no-nonsense approach in this chamber. During his 8 years as a State Representative and 5 years as Assistant Minority Leader, we could always count on Chad to cut through the politics and get straight to the matter at hand. 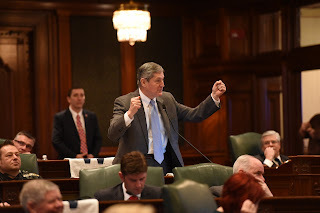 He did this when he passed landmark insurance network adequacy legislation, which offers significant protections and remedies for Illinoisans who rely on narrow networks of insurance providers, and when he passed legislation that improved 9-1-1 network reliability that improved emergency access service statewide. We will also miss those regular Boat Drink Caucus performances at the Butternut Hut and elsewhere in Springfield, where after a tough day at the Capitol, lawmakers from both sides and chambers could unwind and enjoy some good music. Chad always promoted honest dialogue on all points of view on legislative issues while always being a staunch advocate for balanced budgets. We thank Chad for his service to his constituents in Vermilion and Champaign County and wish him the very best. Representative David Harris served the people of Suburban Cook County and the House Republican Caucus from 1983-1993 and then again from 2011-2018. He has been an expert in matters related to budgeting and appropriations, serving all 18 of his years on the House Revenue & Finance Committee- several as Minority Spokesman. 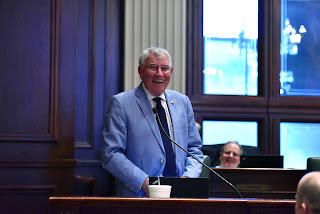 During his time in the General Assembly, he ushered 57 bills into law, including legislation that created a uniform code of military justice for the State of Illinois that is similar to the federal code of military justice. 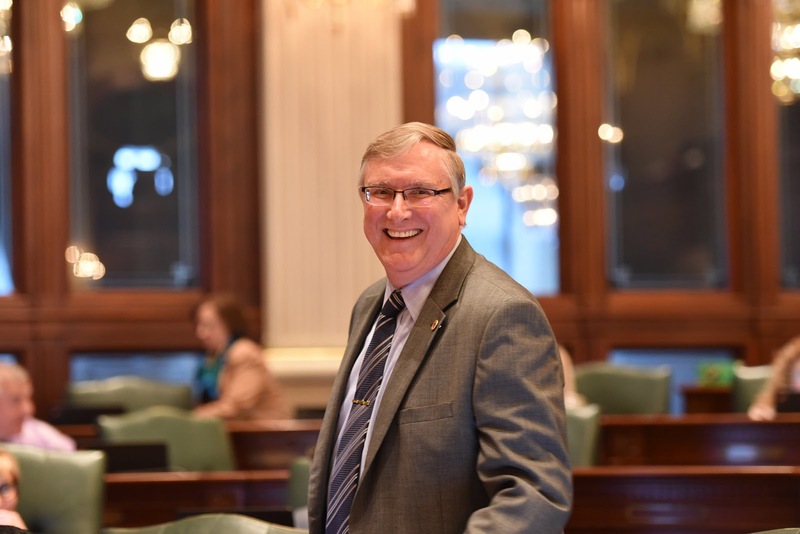 He is also a supporter of the environment, and authored legislation- now law- that requires a certain percentage of vehicles used in Illinois by CMS to be alternative powered vehicles. 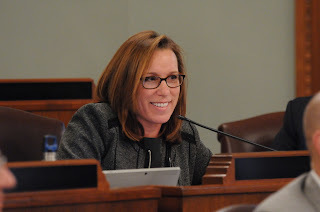 Representative Harris also addressed the important issue of delinquent child support by championing the law that requires casinos and racetracks to deduct child support from the winnings of individuals flagged as “deadbeats.” We thank “The General” for his well-rounded and dedicated service to his constituents and wish him the best as he begins a new chapter in his life. Representative Jeanne Ives will be remembered by this body as being a tireless advocate for taxpayers and government transparency. 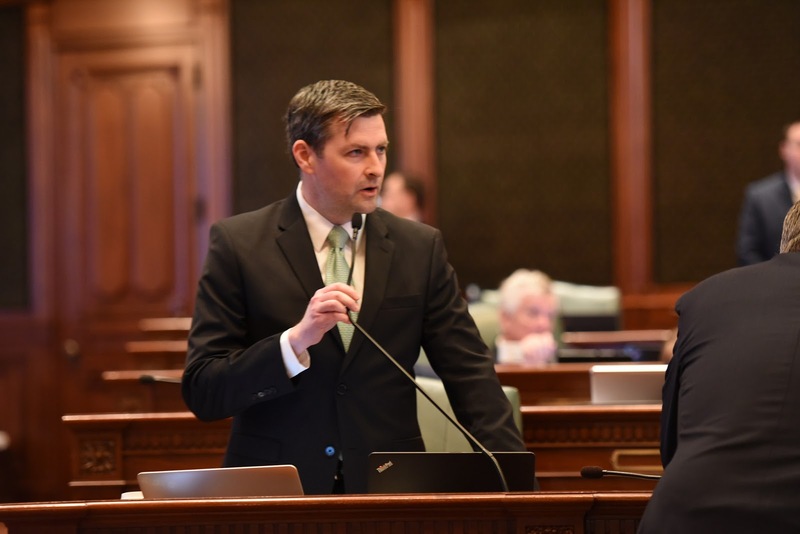 Representative Ives has consistently sounded the alarm on Illinois’ pension crisis and the cost of skyrocketing property taxes on Illinois homeowners and job creators. As a West Point graduate and U.S. Army veteran, Representative Ives has also been an effective advocate for veterans and active duty military personnel and their families. 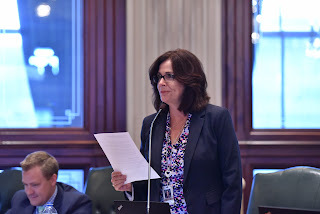 We respect the passion and fierce determination Representative Ives brought to this chamber as she fought on behalf of her DuPage County constituents in the 42ndDistrict. 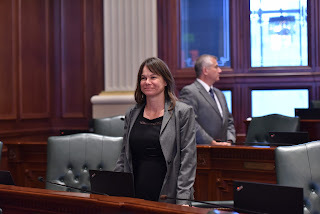 We wish Representative Ives all the best in her future endeavors and thank her for her service. Rep. Sheri Jesiel of the 61st District has been a stalwart defender of taxpayers during her time in Springfield, using her wealth of experience as a CPA in the private and non-profit sectors to promote legislation to reform Illinois’ tax and pension systems. 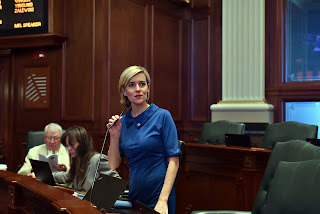 Rep. Jesiel also vigorously took up the causes of human trafficking and domestic violence, passing legislation to improve protections for those affected by these issues and improve police training standards. 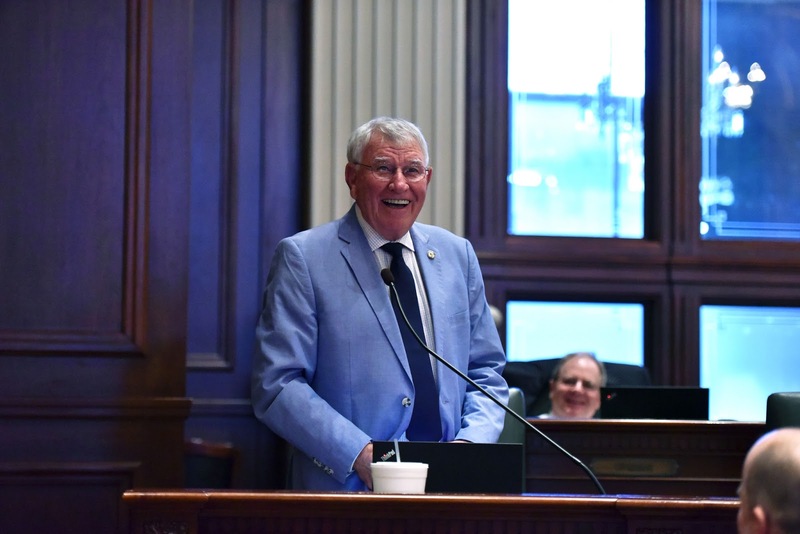 Rep. Jesiel has brought a thoughtful and compassionate approach to legislating that few could match and will be sorely missed. 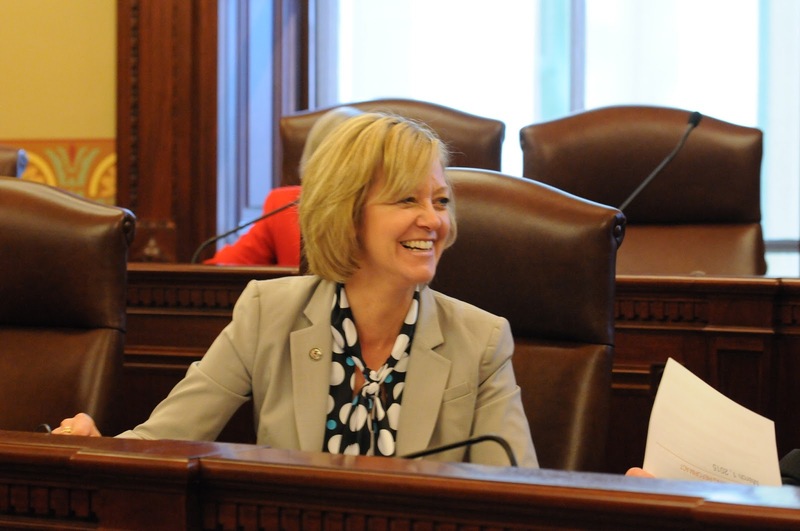 Although Rep. Jesiel will miss representing her hometown here in Springfield, I know she is relishing the opportunity to be closer to home so she can spend more time as Nana to her six grandchildren. Rep. Jesiel, thank you for service to your constituents, our state and our caucus. Representative Sara Jimenez has been an advocate and champion for her hometown and the Sangamon County area for her entire adult life, so it’s no surprise that her focus in the House has been to make her district a place that is welcoming to businesses and families alike. She worked tirelessly to bring good jobs back to the State Capitol. It wasn’t long ago that she stood with her husband Jose and proudly watched his parents become American citizens. She helped host and organize citizen workshops to help other families realize their dreams of becoming Americans too. Thank you Representative Jimenez for your many contributions to making your local communities and all of Illinois a great place to call home. Representative Bill Mitchell was first elected in 1998, spending twenty years working on behalf of the people of Illinois. 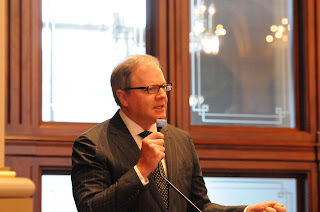 In 2013, Bill was honored to be appointed as an Assistant Republican Leader for our caucus. 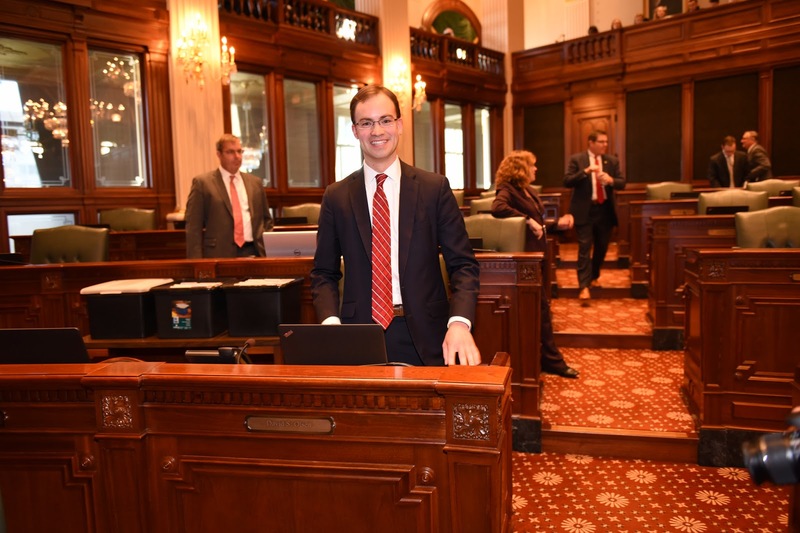 Rep. Mitchell has been a tireless advocate for Central Illinois families. In an effort to save thousands of good-paying jobs, Bill was instrumental in the passage of the Future Energy Jobs Act. He fought for several years to save the Clinton Power Station, the economic engine of DeWitt County and a major employer in Central Illinois. Bill is a fiscal conservative and outspoken critic of wasteful government spending. He sponsored legislation to ground and then sell the State’s $22 million fleet of aircraft, arguing that taxpayers could no longer afford this perk of power. And who can forget his gripping floor speech arguing against the flying of prairie chickens into Illinois? 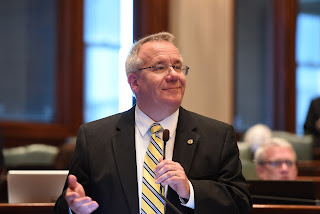 We congratulate our friend and colleague, Bill Mitchell, on his retirement from the Illinois House and we wish him all the best in his future endeavors. In just 2 ½ years, Representative David Olsen has emerged as a very successful member of our caucus. Every bill he passed had wide bipartisan support. He earned the trust and respect of members from both sides of the aisle by fostering solid working relationships and continually finding common ground on legislative issues. David has been a fierce advocate for the constituents of the 81st District. 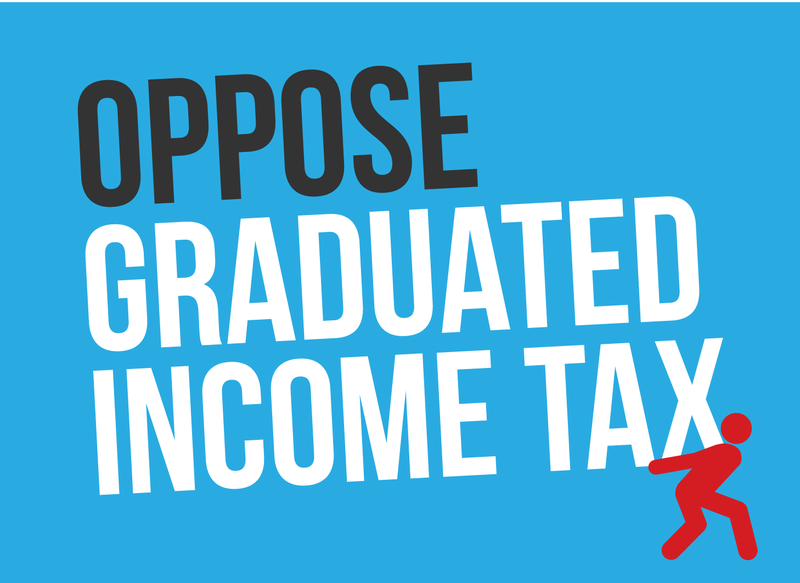 He fought for balanced budgets and responsible spending while also recognizing that the people of DuPage and Will Counties were looking for a more moderate voice on some of the social issues. David truly listened to his constituents’ priorities and supported bills that ensured equal pay and that struck a balance between Second Amendment rights for lawful citizens, and the growing need to protect the safety of children and families. As most of you know, incoming lawmakers usually choose a “softball” as their first bill. Not David Olsen. David’s first bill in this chamber addressed the pressing need for property tax relief and pension reform by increasing the number of hours elected officials must work before becoming eligible for a pension through IMRF. At the age of 30, David Olsen is wise beyond his years. We know a bright future awaits him and we wish him the very best, knowing he will excel in his future endeavors. Reggie Phillips of the 110th District is a voice for making Illinois a more competitive and attractive place to live and conduct business. He is a strong advocate of Eastern Illinois University in his hometown of Charleston, and not only is Reggie Phillips a distinguished representative, he is a successful businessman. In 1986, Reggie and his wife Martha started a residential and commercial building business in Charleston which now employs approximately 400 people. Reggie has made a positive impact in our state during his six years of service in the General Assembly. Reggie Phillip’s commitment to public service and business experience has been invaluable to the General Assembly and House Republican Caucus. 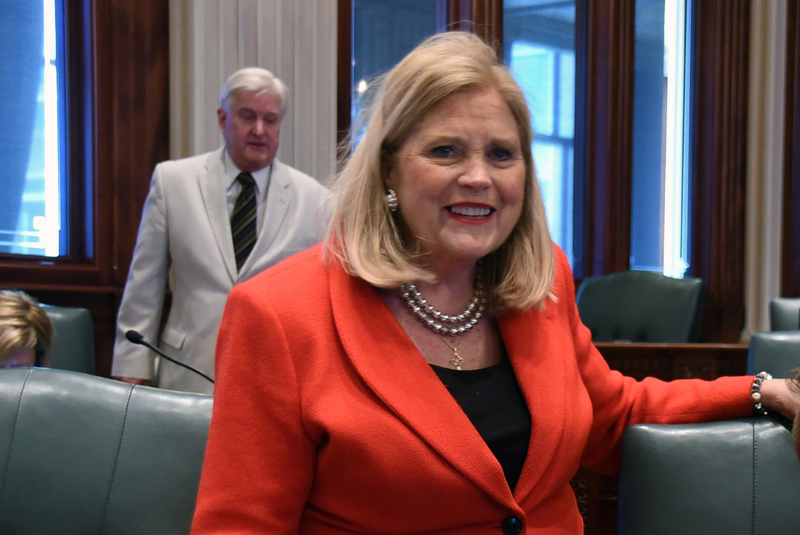 Your insight and expertise will be missed; we wish you and your family all the best and appreciate your commitment to keeping jobs in the State of Illinois. Representative Bob Pritchard proudly served the 71st District of Illinois for 15 years. During his time representing portions of DeKalb, Kane, and Boone Counties, he was a strong advocate for education, economic growth, and fiscal responsibility—making significant strides to improve our state. He was a leader in education reform efforts which produced the historic K-12 school funding reform agreement to adequately and equitably fund education--and also passed legislation to help attract students to our institutions of higher education here in Illinois. 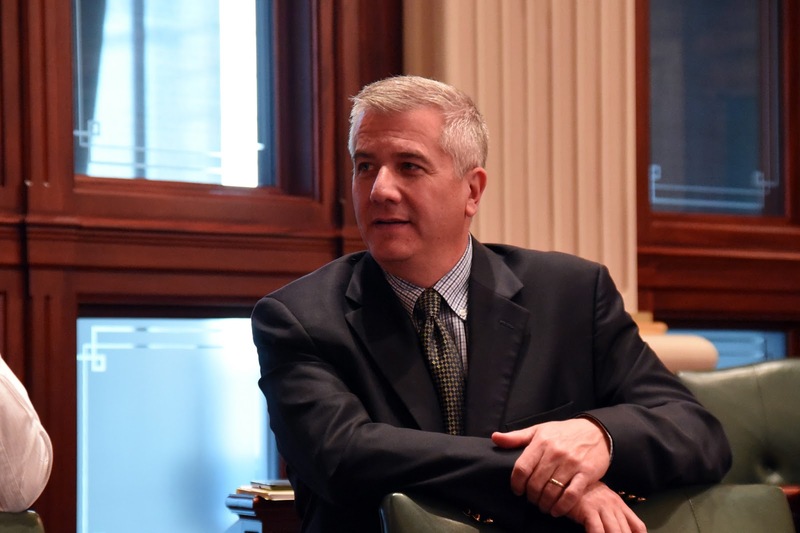 Rep. Pritchard continues to serve the community working for education in a different capacity in his position on the Northern Illinois University Board of Trustees. 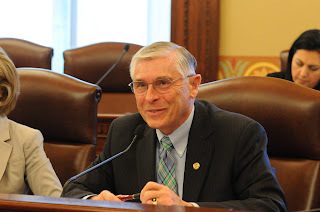 Representative David Reis has served the people of southeastern Illinois for 14 years in the Illinois House. In 2017, David was promoted to the role of Assistant Republican Leader for the House Republican Caucus. David is a farmer/businessman who lives in Jasper County on his family’s fifth-generation farm near the village of Ste. Marie, where the Reis’ have farmed for over 150 years. 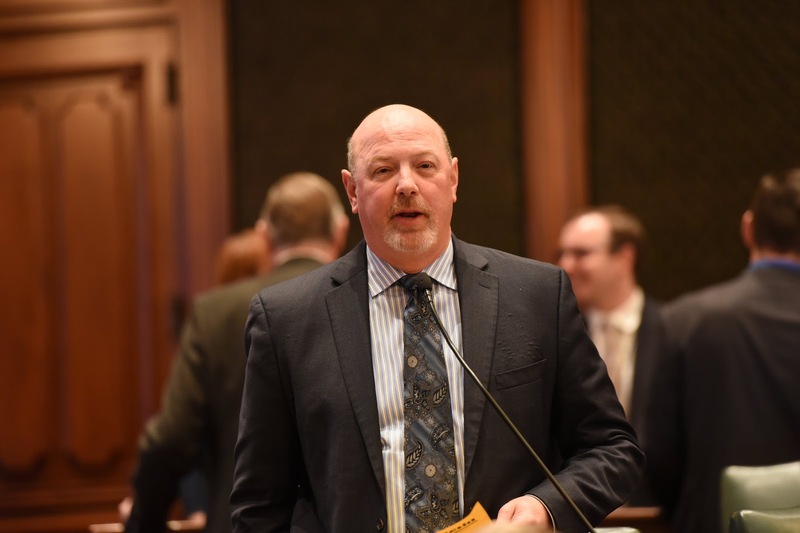 Prior to joining the House, David served on the board of the Illinois Pork Producers Association. As a free-market conservative voice, David was instrumental in the passage of important legislation related to energy policy and hydraulic fracturing, job creation, concealed carry, and raising the speed limit on Illinois interstate highways. We thank our friend David Reis for his many years of dedicated service and wish David and his wife Maria all the best in the future. Rep. Brian Stewart of the 89th District has been a stalwart supporter of common sense in Springfield, a defender of public safety in a decorated career in law enforcement, and an innovative business leader and job creator in his community of Freeport. Many don’t know Rep. Stewart spent his formative years in public housing and worked to pull himself up by the bootstraps --- although my guess is his military service helped with that as well---and became a first responder and job creator, employing hundreds in his hometown. If that’s not the American Dream, I don’t know what is! Thank you for your service to our country, to your constituents and to our caucus, Rep. Stewart. We wish you the best of luck in the Senate. Rep. Barbara Wheeler of the 64th District has never been afraid to take on the big issues during her time in Springfield. I’m sure her experience in the Peace Corps had something do with the determination she brought to getting things done down here. Rep. Wheeler spearheaded efforts to crack down on repeat DUI defenders and close loopholes to prevent guns from getting into the hands of potentially dangerous individuals. But Rep. Wheeler’s most passionate issue has been human trafficking, acting as the driving force behind several pieces of legislation to increase awareness, enhance reporting and provide recovery services for those affected. 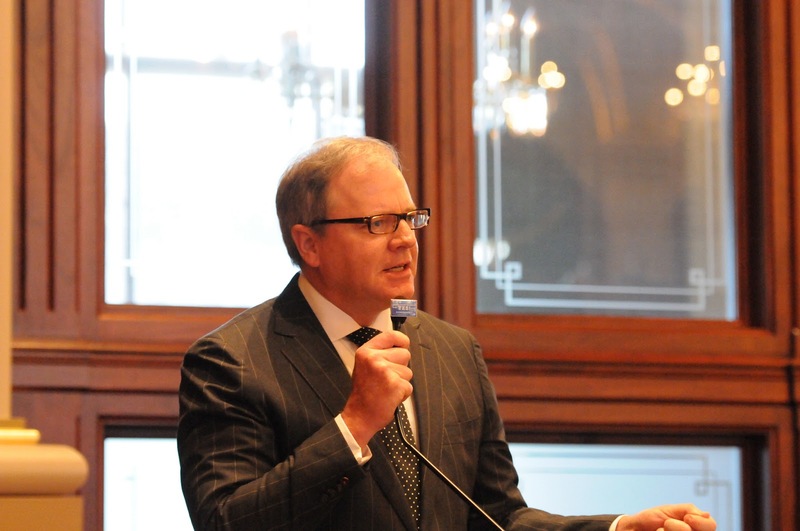 Rep. Wheeler, thank you for your service to our state and our caucus. We wish you the best of luck in your future endeavors. Representative Christine Winger has served the communities in her 45th District for two terms. During her time in Springfield, she worked to improve the quality of life for families, veterans, and seniors—and was strong supporter of animal rights and welfare. Rep. Winger worked tirelessly to provide relief for area residents from the noise levels at O’Hare Airport. 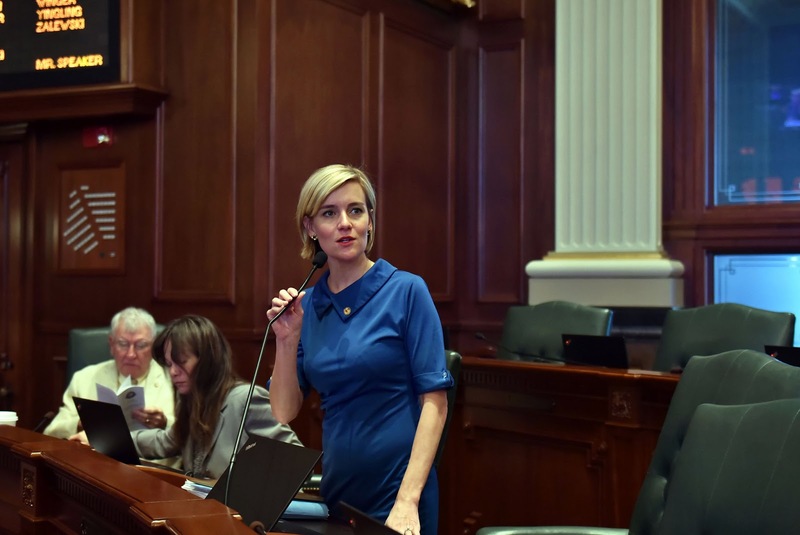 Representative Winger is also part of a small group of lawmakers who have given birth while in office, when she and her husband Mark welcomed her daughter Samantha into the world on September 10, 2015.